Previous pages have illuminated the global processes that have given rise to a dominant culture of consumerism and infantilisation. This chapter will explore in more detail a number of drives that appear to be affecting the lives of these committed consumers. 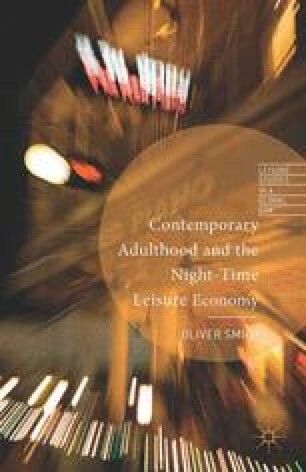 For many of the people who form the basis of this research, participation within the night-time economy (NTE) has been a constant throughout their adult lives, which are characterised by the use of alcohol as a commodity around which to frame friendships. In the previous chapter, we saw how Rob and Andrea only see their friends on occasions that are mediated by alcohol, creating something akin to dependence on marketised excess as they return time and time again to consume amounts of alcohol that far transgress the government guidelines for responsible use.1 The purpose of this chapter is not only to investigate why these individuals retain such an attachment to the (NTE) as they progress through their thirties and continue to nurture an identity that is firmly ensconced within the machinations of global consumer capitalism, so much as it is to delve further into a consideration of the derivation of enjoyment that they extract from the NTE. Respondents often reported that a bad night out was not uncommon, and complained of the repetitious nature of their excursions. However, despite the financial implications of wasting money on a bad night out, and despite the option of seeking alternatives of neighbouring bars or even neighbouring cities, these individuals return interminably in search of the elusive great night out.